When I was in – we’ll say middle school, for the sake of argument – I recall seeing a video of astronauts in space that showed what their everyday life was like. One of the little clips showed them “drinking” water. What they were actually doing was chasing down little mouthfuls that floated, like bubbles, away from a full bottle because there was nothing to hold them down. Water isn’t much of a problem, but other liquids might be sticky, hot or otherwise cause problems floating about. One astronaut decided that he could do something about this problem and make it possible for astronauts to actually drink from a cup while in space. 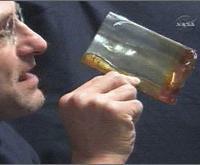 Astronaut Don Pettit, aboard the International Space Station, managed to mold a plastic cup that would allow him to sip coffee from a cup, rather than from a pouch (the current standard liquid delivery system in space). The cup is designed – to put it very, very generally – to draw the coffee up towards a small opening, letting the astronaut sip instead of forcing him to slurp.